occurs in 1 of 2,500 post-menopausal women in the United States and is the most lethal gynaecological malignancy, accounting for 5–6% of all cancer-related deaths. When ovarian cancer is diagnosed at early stages, the survival rate is close to 90%; however, the vast majority of patients are identified when they have late-stage disease. This is primarily because ovarian cancer has few early or specific symptoms. Stage I: cancer has invaded one or both ovaries. Stage II: cancer has invaded one or both ovaries and has spread into the pelvis. Stage III: cancer has invaded one or both ovaries and has spread to other abdominal organs and structures. Stage IV: cancer has invaded one or both ovaries and has spread to form metastases at a distance not only in the abdominal cavity, but also in other organs, the liver is invaded by cancer cells. One of the best ways to diagnose cancer early, aid prognosis and predict therapeutic response is by using diagnostic or prognostic serum and tissue biomarkers. A biomarker is a biological molecule found in blood, another body fluid or in tissues that is a sign of a normal or abnormal process. Biomarkers are produced by either the tumour itself or other tissues, in response to the presence of cancer or other associated conditions. Tumour markers can be used for screening the general population, differential diagnosis in symptomatic patients and clinical staging of cancer. They can be used to estimate the tumour volume, evaluate response to treatment, assess recurrence through monitoring and as prognostic indicators for disease progression. The most studied marker for ovarian cancer is CA125 and determination of its concentration in circulation is essential for monitoring response to treatment for ovarian cancer. It has been proposed as a possible screening test for this disease. However, this marker has low sensitivity, as its expression is increased in fewer than 50% of early-stage ovarian cancers and it is not expressed by tumour cells in 20% of women diagnosed. Its expression is increased in many benign gynaecological diseases, such as endometriosis and outside of the female genital tract in tissues such as lung, breast and prostate. Successful screening strategies must demonstrate a sensitivity of 75% and a specificity of ≥99.6% to obtain a positive predictive value (PPV) of 10%. Currently, there are no screening strategies with proven efficacy for the early detection of ovarian cancer, there are several screening trials currently underway that are based on transvaginal ultrasound, or serum concentration of CA125 combined with transvaginal ultrasound as part of a multimodal screening strategy. It does not provide optimal sensitivity for early detection. The challenge is finding a marker detect clinically evident ovarian cancer but also early disease, before it causes symptoms. Recent study examined the ability of six serum biomarkers to discriminate between disease-free individuals and patients with ovarian cancer using a multiplex, bead-based immunoassay system, the combination of the six markers (leptin, prolactin, osteopontin, insulin-like growth factor 2, macrophage inhibitory factor and CA125) exhibited better discrimination compared with CA125 alone (95.3% sensitivity with 99.4% specificity). Most of the proteomic technology platforms for biomarker discovery focus on the implementation of mass spectrometry techniques. Discover new cancer biomarkers by using mass spectrometry and microarrays. The hypothesis is that combining high-throughput strategies might facilitate the delivery of more effective candidate molecules for cancer diagnosis and prognosis. is the most commonly used biological fluid for biomarker analysis in clinical practice. Obtained through a minimally invasive procedure, abundantly available, reflect diverse pathological states. This large dynamic range of analytes in blood is a major disadvantage, it contains active proteases, lipids and other components that can vary with diet and lifestyle. The proteomic-pattern profiling technology use a small amount of unfractionated serum add to a protein chip, analysed by surface-enhanced laser-desorption ionization time-of-flight mass spectrometry (SELDI-TOF-MS) to generate a proteomic signature. For the diagnosis of ovarian cancer, the sensitivity was claimed to be 100% (even for early-stage disease) with 95% specificity. Subsequent work concluded that these data were erroneous owing to biases in sample collection and handling, and bioinformatics artefacts. Another study, using serum, examined three biomarkers (apolipoprotein A1, a truncated form of transthyretin and a cleavage fragment of inter-α-trypsin inhibitor heavy chain H4) obtained from a multicenter serum proteomic expression analysis. The 3 markers, along with CA125, had a sensitivity of 74% and a specificity of 97%. Analysed by SELDI-TOF MS the changes seen are epiphenomena that are likely to prove to be non-specific. identifying tumour secreted proteins. Ovarian cancer ascites contain many cells of tumour origin and many soluble factors released by tumour cells or the tumour microenvironment. A recent study used four patients with ovarian cancer who had high-grade serous carcinoma to carry out an in-depth proteomic analysis of ovarian cancer ascites: identified more than 2,500 proteins, only ~230 were identified in the soluble fraction, produced a list of 80 potential biomarkers. Many of candidates were intracellular proteins that have not yet been validated, and CA125 was identified in one patient sample only. proteins from tissue could enter and be measured in the bloodstream but some differentially expressed proteins at the tissue level might be degraded by endogenous proteases. The laser capture microdissection (LCM) provides a means of extracting pure cell populations from the surrounding heterogeneous tissue. Ovarian tumour cells could constitute a minor fraction of the whole cell population. secreted proteins and membrane proteins shed from tumour cells are promising cancer biomarkers. Cell lines are readily available and the analysis by mass spectrometry is straightforward, reproducible and in-depth. But no single cell line can recapitulate the heterogeneity of human tumours and that it is an in vitro system, devoid of contributions of the host-tumour microenvironment. have been used extensively in therapeutics but rarely in diagnostics. Advantages: is an in vivo model which incorporates host–tumour interactions. Is possible to implant xenografts of human cancer tissues into mice but recognizing that crucial features of the tumour microenvironment are altered in such cases. The mouse plasma proteome is as complex as the human, there is an increase concentration of potential biomarkers in plasma but is unclear whether the same genetic alterations transform both mouse and human cells. In a study, plasma from control and ovarian cancer bearing mice were subjected to in-depth proteomic analysis to yield ~100 proteins that were increased in the plasma of tumour bearing mice. Comparison of these proteins, half of these were present in the mouse plasma proteome, including human epididymis protein 4 (HE4; also known as wFDC2) — a known ovarian cancer biomarker. used to compare gene expression profiles in ovarian cancers and normal ovaries. Studies to identify new molecular biomarkers for the early detection of ovarian cancer by gene expression profiling. Gene expression levels reflect the cumulative effect of several underlying biological functions as DNA-microarray technology has enabled the simultaneous examination of thousands of genes. Studies have used microarray analysis to identify gene expression profiles that are associated with ovarian cancer. A new ovarian cancer biomarker discovered using cDNA microarrays is HE4. recently approved by the us Food and Drug Administration for monitoring patients with ovarian cancer. Study of oligonucleotide microarray analysis on fresh-frozen samples from ~60 patients. Of the ~22,000 probe sets on the array, ~1,400 showed evidence of encoding secreted proteins. In serous ovarian carcinomas 275 of these were identified as differentially expressed. Enzyme-linked immunosorbent assay (ELISA) was used to validate the findings from microarray analysis using an independent validation serum sample set consisting of 67 serous ovarian carcinomas, 67 healthy women and 15 patientswith cystadenofibromas of the ovary. Combined with CA125 four proteins, matrix metallopeptidase 7 (MMP7), kallikrein 10 (KlK10), osteopontin (OPN) and secretory leukocyte peptidase inhibitor (SLPI), yielded a sensitivity of 95.7% and 100% specificity. The limitation of this study was that the number of patients with early-stage ovarian cancer was low. sub-proteome of ovarian cancer ascites fluid yield approximately 450 proteins. Among the 450 proteins, 25 were previously identified as ovarian cancer biomarkers. The final filtering criterion consisted of comparing the 91 proteins from the ascites proteome with the proteome of condition media of 4 ovarian cancer cell lines and retaining common proteins only. Verification of some candidates (n = 15) by ELISA in the serum of 100 healthy women, 100 women with benign gynaecological conditions and 100 women with ovarian carcinoma, highlighted nidogen 2, a basement membrane protein, as a candidate ovarian cancer biomarker. Both serum, nidogen 2 and CA125 concentrations in patients with ovarian cancer were increased. The ROC curve analysis, nidogen 2 had an area under the curve (AUC) of 0.73 but CA125 was superior with an AUC of 0.93 and there was no complementarity between the two markers. New technological approaches could indeed identify potential biomarkers but that their superiority compared with existing ones is not a given combining two sources to mine revealed a new ovarian cancer biomarker, with a yield of approximately 7% (1 marker of the 15 tested). Consequently, the false discovery rate was 93%. Combination of multiple sources compared the proteomes of ovarian cancer cell line studies each identifying 961 and 383 extracellular and/or cell membrane-bound proteins, respectively. Were added two proteomic studies on soluble ovarian cancer ascites fluid identifying 170 and 373 proteins, respectively including 1 proteome of ovarian cancer tissues, identifying 69 proteins that were differentially expressed between malignant and benign tumour groups and 1 microarray data set of 21 genes that were overexpressed in serous carcinoma to generate a list of overlapping, prospective ovarian tumour markers. There were no proteins common to all six data sets several proteins were identified in at least 2 of the data sets examined, and 33 proteins were identified in at least 3 data sets. Two proteins were found in four data sets: HE4 and granulin. HE4 is made up of two whey acidic protein domains and four disulphide core domains and is over expressed in ovarian cancer. ovary, and this has suggested a role as a possible serological marker of this cancer. Biological sample: serum. 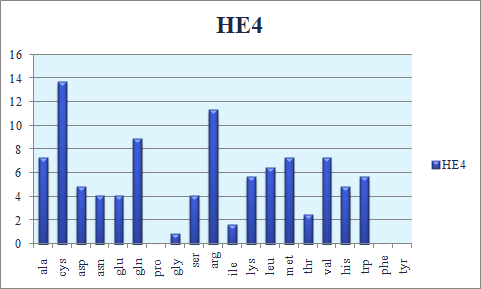 HE4 has a sensitivity of 72.9% and a specificity of 95%. It belongs to a family of protease inhibitors that function in the immune response. Unlike CA125, which is increased in patients with advanced endometriosis, HE4 expression is not increased in many common benign gynaecological or other conditions. A study of women with benign ovarian tumours compared with women with invasive epithelial ovarian cancers has shown that the combination of HE4 and CA125 yielded a sensitivity and specificity. Isolation of HE4 provides strong credence to the hypothesis that promising new biomarkers can be identified through this approach. HE4 is expressed in the male epididymis. A, illustration of the region on chromosome 20q13 that harbors the WAP gene cluster, including HE4, SLPI, and Eppin-1. B, immunohistochemical (IHC) staining of human epididymis with HE4 antibodies (20× objective) shows an apical and luminal distribution. GST antibodies at higher concentrations than those used for HE4 did not elicit a specific signal in the epididymis. C, HE4 antibodies can detect GST-HE4 and recombinant HE4 synthesized in High Five insect cells by Western blot. D, HE4 antibodies can specifically immunoprecipitate (IP) recombinant HE4, including the glycosylated form. Preimmune normal rabbit IgG served as a negative control. HE4 belongs to the family of whey acidic four-disulfide core(WFDC) proteins with suspected trypsin-inhibitor properties. However, no biological function for HE4 has yet been identified. a protease inibitor involved in sperm maturation. Antibody against HE4 localize the protein over entire surface of spermatozoa. GRN, is a secreted protein, is known to have a role in the regulation of inflammatory response and in wound healing and repair, it is also a growth factor that has been shown to be highly expressed in invasive epithelial ovarian cancers. Recently study with three biomarker discovery sources for ovarian cancer. In all three data sets 58 proteins were identified (including He4), from which 25 proteins were selected. 8 proteins (including GRn) were found to be significantly increased in patients with ovarian cancer compared with controls. Using an independent validation serum sample set, five of the eight proteins were found to have increased expression levels (GRn, IGFBP2, RARRes2, TIMP1 and CD14). The integration of various sources to mine for biomarkers can indeed yield promising candidates. There is now a need to bridge biomarker discovery with further verification, assay optimization, validation and commercialization steps so that the biomarkers can reach the clinic.